Lockheed F-104A Starfighter, a photo by Tuzen on Flickr. 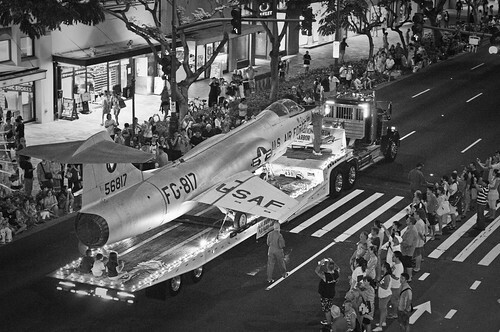 I was in Hawaii in December, and one night we watched the Pearl Harbor Memorial Parade from our hotel balcony. I was impressed with this very convincing airplane-float, so I took a picture for investigation later. It turns out this is a real airplane! The F-104 Starfighter, and this particular tail-number are well documented. They were used '58 - '69, not WW2. Many remaining Starfighters are on display around the world - and one will fit on a truck.